Critics are asking who is running the government with all these ministers in Karnataka but government officials said ministers have been clearing files whenever they are in Delhi. New Delhi: At least 10 cabinet ministers, 11 ministers of state, chief ministers of several states — almost the entire party brass. The BJP has pressed all these and more into service in its final push to try and dethrone Siddaramaiah’s Congress government in Karnataka. Five other ministers were out of the capital for non-election related obligations Thursday, the last day of campaigning for the 12 May vote. Karnataka leaders Ananth Kumar and D.V. Sadananda Gowda (both cabinet ministers), Anant Kumar Hegde (minister of state), and the BJP’s state in-charge Prakash Javadekar (also a cabinet minister) have been stationed in the poll-bound state for several days now. 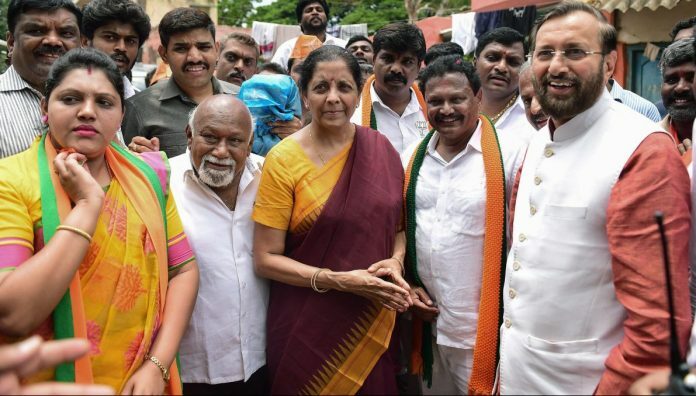 The cabinet ministers who joined them in Karnataka Thursday included Nirmala Sitharaman, J.P. Nadda, Harsh Vardhan, Piyush Goyal, Dharmendra Pradhan, Thawarchand Gehlot and Suresh Prabhu. The ministers of state who joined them are Ramesh Jigajinagi, Krishna Pal Gurjar, P.P. Chaudhary, Santosh Kumar Gangwar, Jitendra Singh, R.K. Singh, Gajendra Singh Shekhawat, Shiv Pratap Shukla, Subhash Bhamre and Pon Radhakrishnan. Chief ministers Shivraj Singh Chouhan (Madhya Pradesh) and Raman Singh (Chhattisgarh) also thronged the state in the last leg of campaigning. Uttar Pradesh CM Yogi Adityanath and Assam CM Sarbananda Sonowal had also campaigned in the state. While critics are asking who is running the government with all these ministers in Karnataka, government officials told ThePrint that ministers have been clearing files whenever they are in Delhi. “Work is not hampered, as the ministers are always accessible even while out campaigning. They come and go. Many have already campaigned and now are in Delhi. So it is not that government has come to a standstill,” one source said. The union cabinet meets every Wednesday, but the meeting did not take place this week. Sources in the government said the meeting would not be rescheduled for a later date.